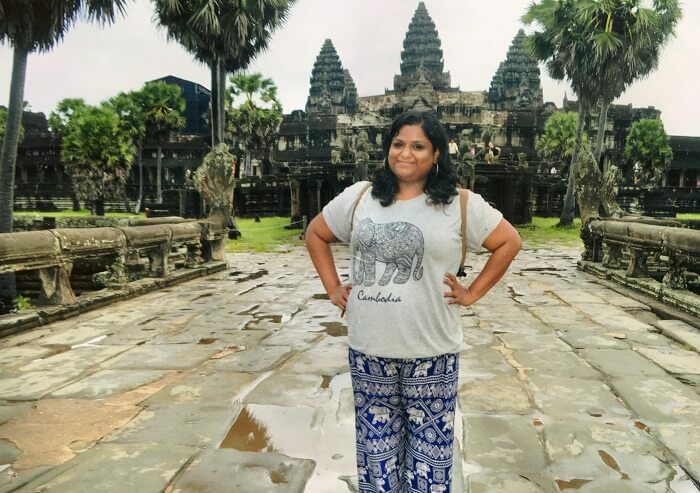 Divya had been thinking of visiting Vietnam & Cambodia for quite some time. 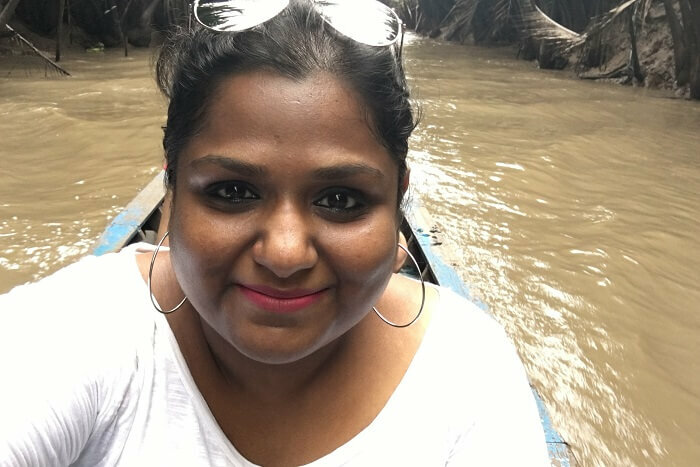 When she could finally take a break from work, she planned a solo trip to these two countries for an indulgent affair with their culture, history, and architecture. 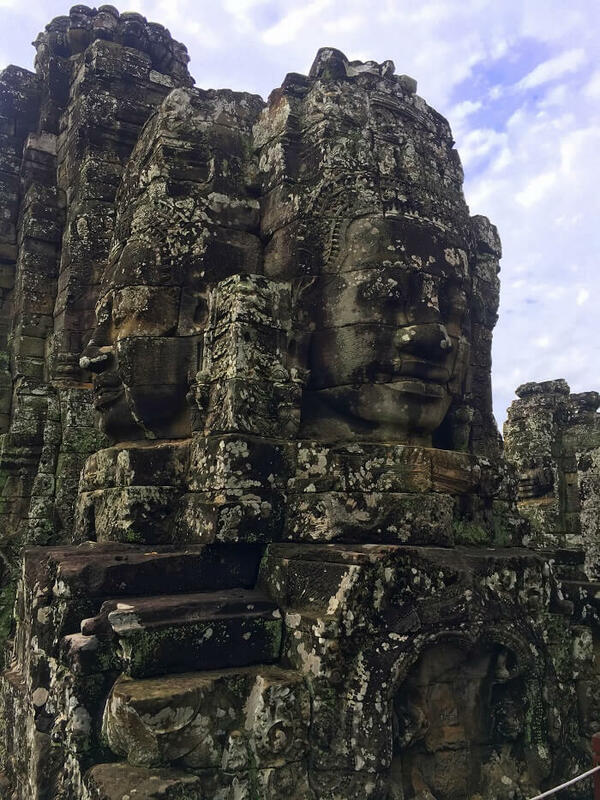 She booked herself a 6 night 7 days Vietnam and Cambodia tour package from TravelTriangle and set off to experience the best of both worlds – the temple ruins of Cambodia and the unique heritage of Vietnam! For many, travel is a means of escaping the routine. For me, it is a means of learning how to live. I have learned so much about the world, its people and more importantly about myself while on the road. It is very difficult to explain the excitement when I board a flight to my next destination, the happiness when I stand in front of the highlight of the city, the eagerness when I meet fellow travellers or locals, the sense of familiarity I develop after spending a few days in a new city or the heartbreak I experience when it is finally the time to go home. I believe we all have a travel style. Some like luxury, some like an unplanned trip, and some like to go with the flow. I call myself “A Nomad With A Plan”. I like making spontaneous plans and going with the flow, but only after doing a thorough research and making a rough sketch of the trip. This way, I do touristy things as well as enjoy the culture of the city as a local. This is why I like Travel Triangleextremely flexible and help you plan your trip according to what you like. You can book an entire trip or part of it as per your plan. 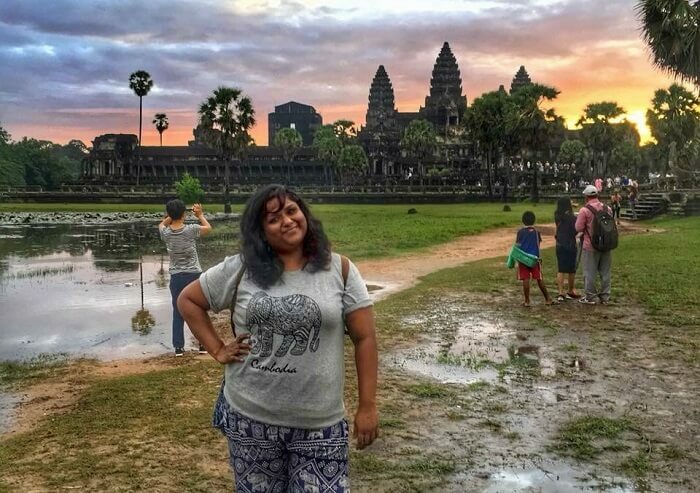 When I could finally take a break from work, I planned a solo trip to these two beautiful countries that have been on my bucket list since forever. 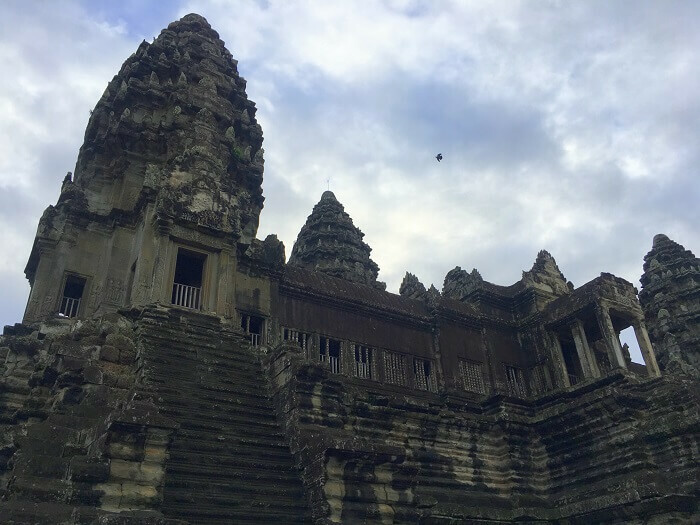 I was not only star struck with the idea of visiting the largest Hindu temple complex – Angkor Wat, but also wanted to understand the spine-chilling history of these countries. 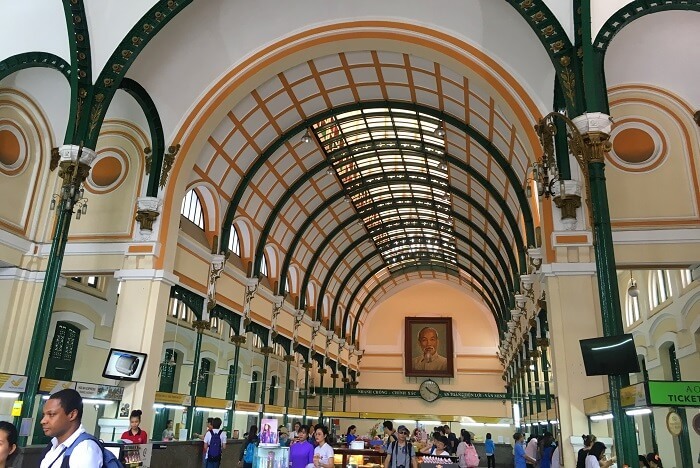 I reached Ho Chi Minh in the morning, after which I was transferred to my hostel. I checked into the New Saigon Hostel in Bui Vien St. and slept for some time. That night, along with my Japanese roommate, I walked around the city to get a taste of the local life of Vietnam. 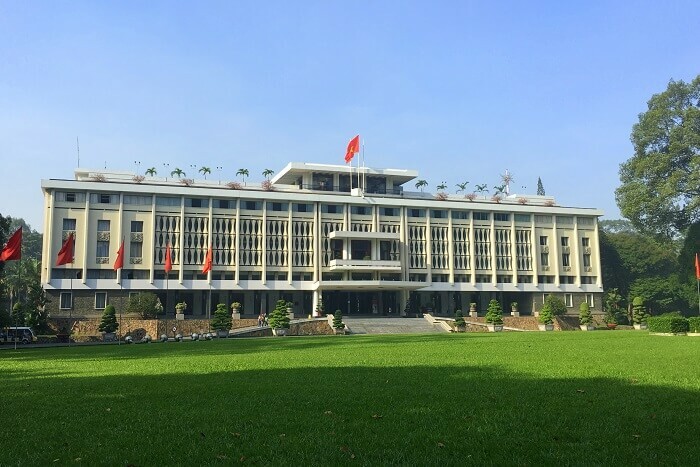 We saw the Reunification Palace from outside, shopped a little at Ben Thanh market, and had fun in the Bui Vien St which is more commonly known Pub Street. I also happened to bump into an old college friend there, which made the night quite fun! 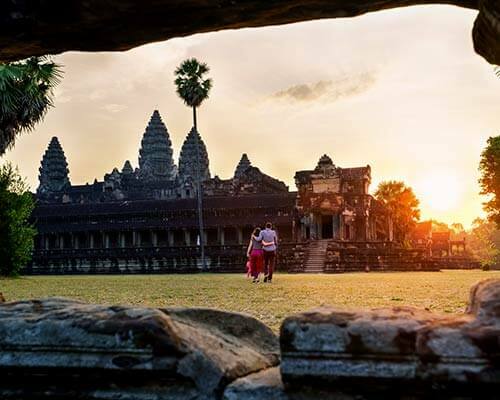 Visit Cambodia- Vietnam for your honeymoon and enjoy gorgeous beaches, sparkling bays, colonial structures, stunning landscapes, and colorful culture. Experience luxury at low cost. 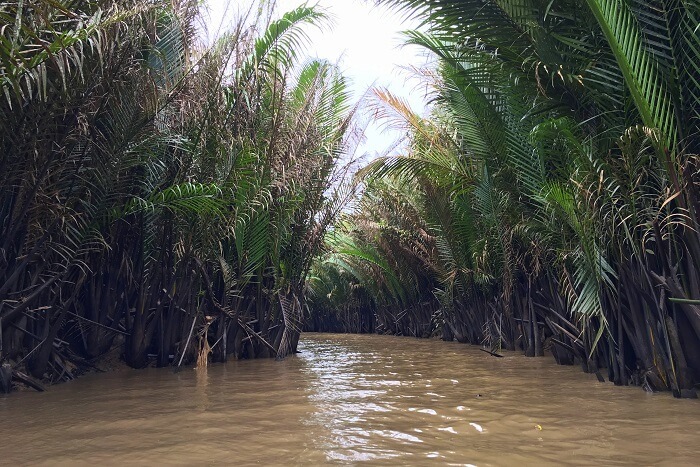 The plan for this day was to visit Mekong Delta. 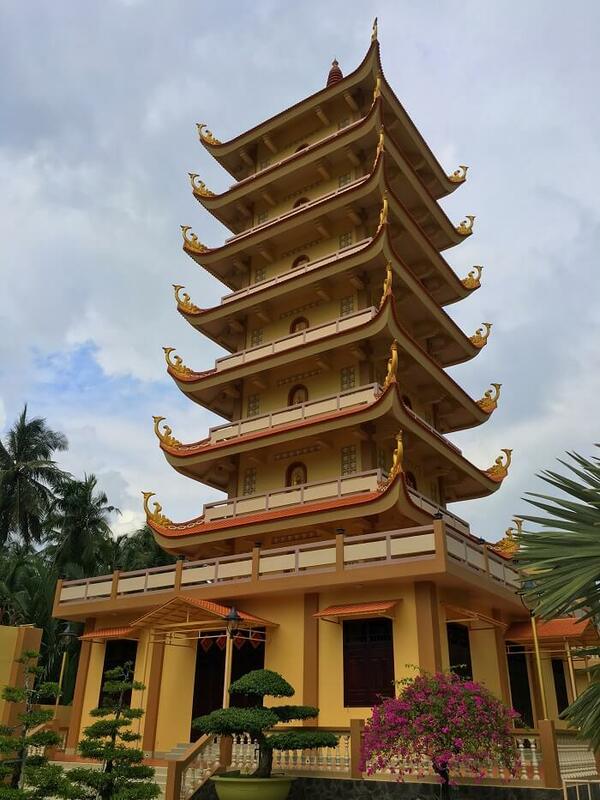 I, along with a group of other travelers, set off to the first stop on this tour – the Vinh Trang Temple, which is a beautiful Mahayana Buddhist Temple that exuded calmness and peace. 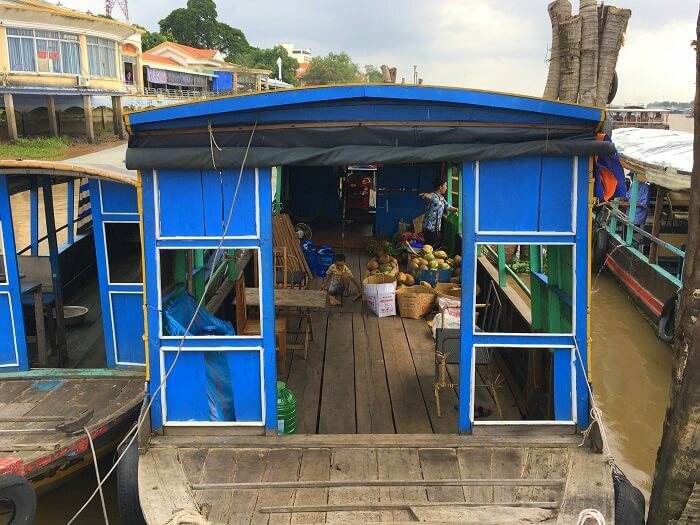 After the temple, we went to the dock to catch a boat to the Mekong Delta. I was very excited about the activities planned for us. We rowed marshy waters and thick mangroves. 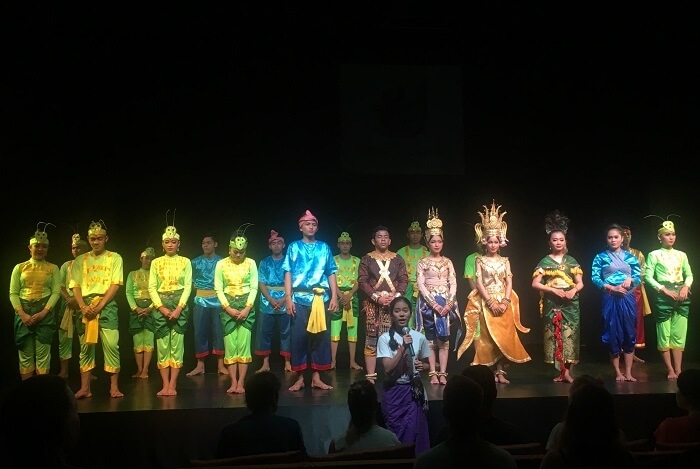 Upon reaching, we were welcomed with a herbal tea, fresh tropical fruits, and an amazing singing performance. After we were refreshed, we went to a bee farm, witnessed the honey-making process, and tasted some yummy fresh honey. We then took a kayak and sailed through some beautiful woods and thick mangroves with our adrenaline soaring high. We landed at the Coconut Candy workshop, where our excited group watched how these sweet candies were made and I bought some for home as well. In Vietnam, I got to taste some of the best vegetarian food I have ever had. 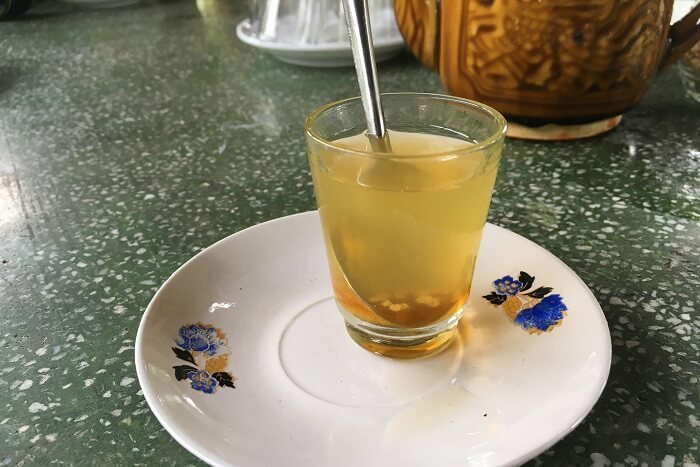 I used to savour every bite of whatever meal I had in Vietnam. After a traditional Vietnamese lunch, we roamed around the beautiful island and saw many exotic trees, flowers, and animals. And as we sailed towards the city, we enjoyed the calm waters of the river and some sweet coconut water. After a calming day at Mekong Delta, it was now time to visit the local sites in Ho Chi Minh City to understand their history better. We started with the Reunification Palace. The palace was a paradox – it was luxurious and yet ready for a sudden war. Vietnam was engaged in many wars for many years – with the Chinese, the Americans, and more. Hence, they were always prepared for attacks. 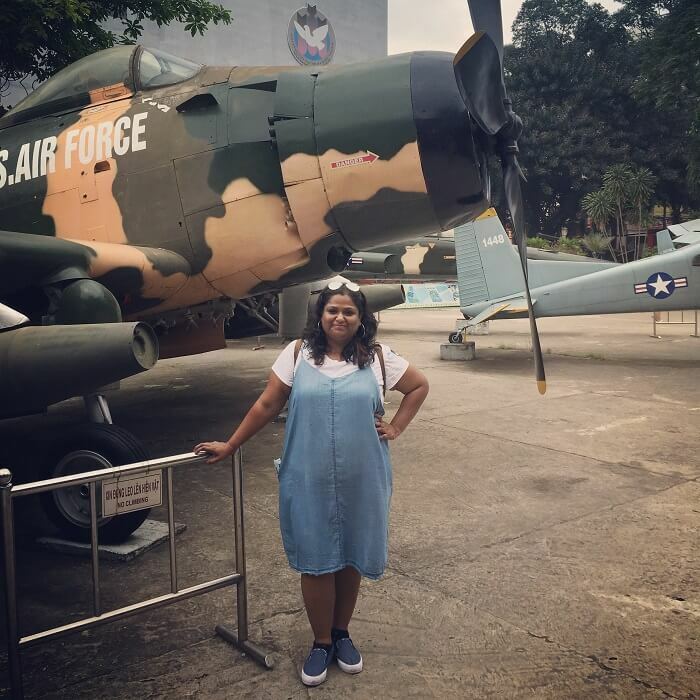 Next, we went to the War Remnants Museum where we saw some fighter vehicles and planes. We could also go through a photo journey of what exactly the Vietnamese had to go through. It was heartbreaking to see those deep scars that were left after the Vietnamese soldiers were flushed out of the forests by those merciless American troops. Our last stop was at the Church and the Central Post office. Apart from still being in working condition, the Post Office has a little market inside where you can pick up some cute souvenirs. 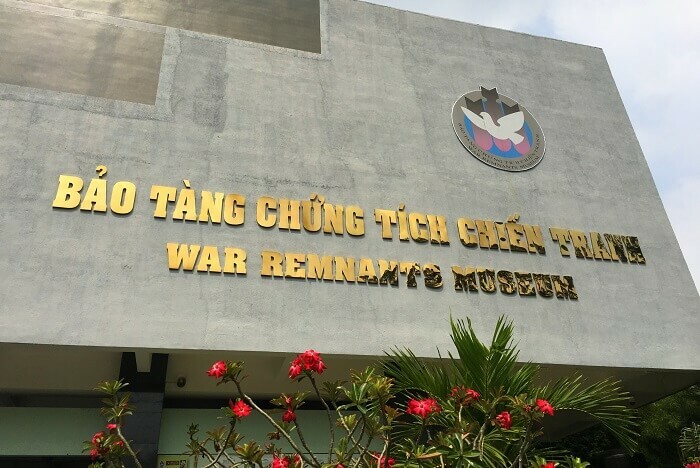 As I was supposed to leave for Phnom Penh that evening, I missed a very important landmark in Ho Chi Minh City – The Cu Chi Tunnels. 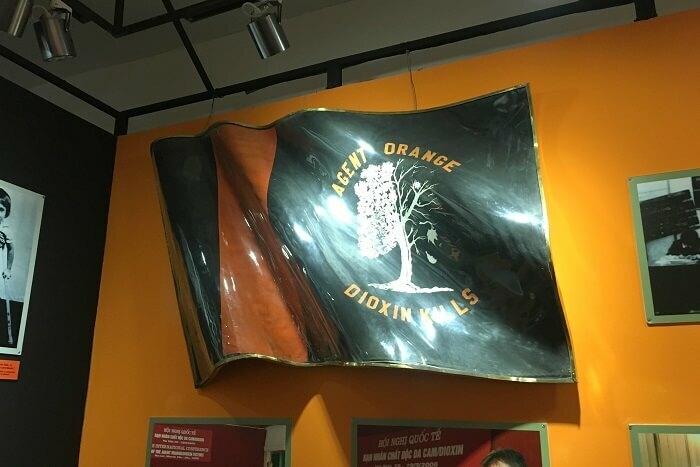 Hundreds of Vietnamese soldiers had made it their home to protect themselves from the US attacks. 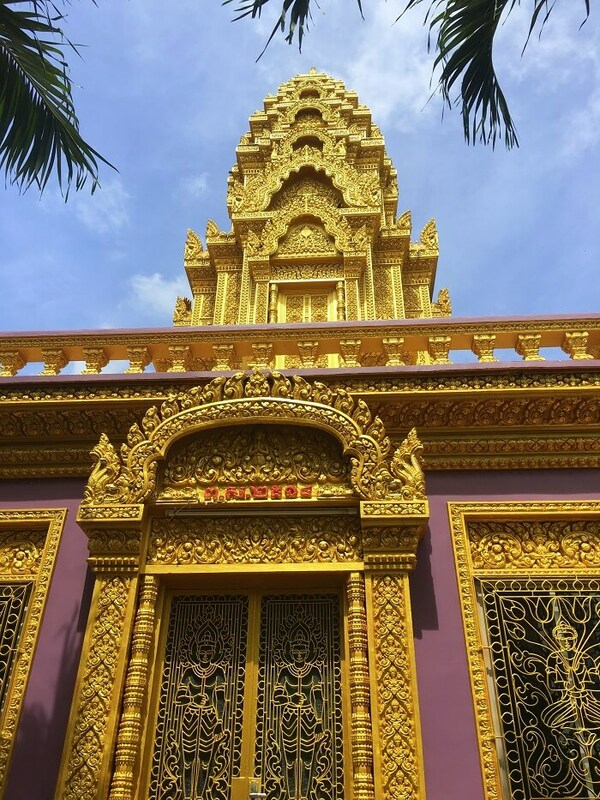 After a long bus ride to Phnom Penh, I was exhausted, but since I did not want to waste my day lazing around, I decided to go around the city at my own pace. I checked into a very comfortable Hostel – the Sla Boutique Hostel. I then visited the magnificent Royal Palace. The golden roofs looked fabulous against the blue sky! 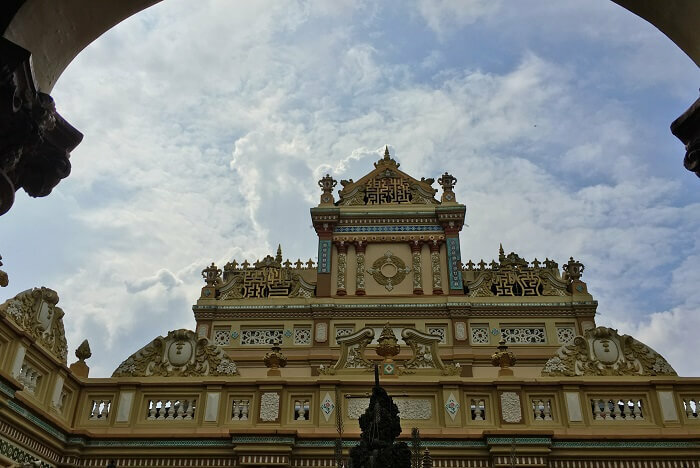 After the palace, I went to the National Museum, Wat Phnom, and wandered around the city in a Tuk Tuk. 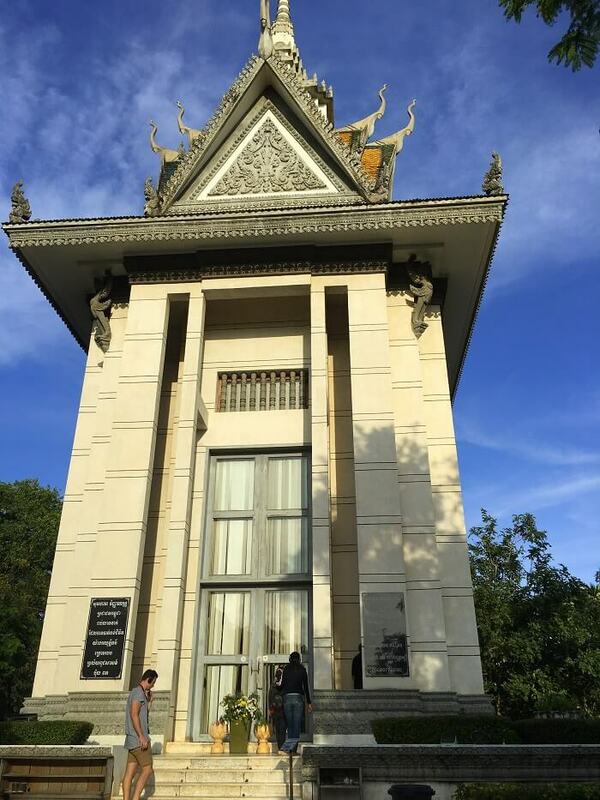 I then took a Hop On Hop Off bus to visit two very gruesome places – The Genocide Museum and the Killing Fields. Thousands of lakhs of Cambodians were tortured and killed to honour the utopian ideology of a single man – Pol Pot. It was a very somber experience and I could not stop tears from falling as I heard the upsetting stories behind the killings. 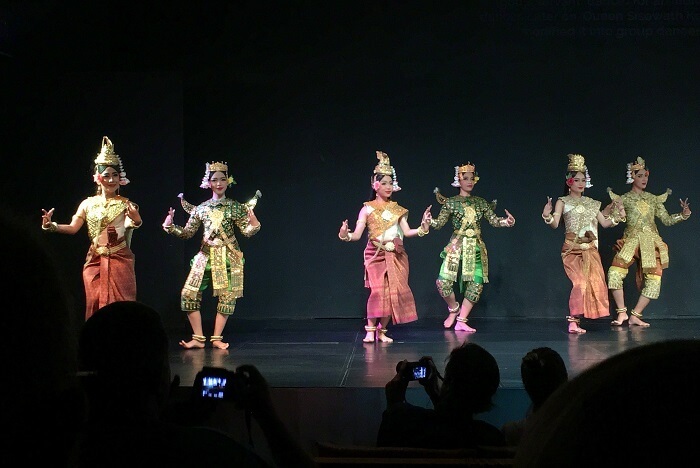 To lighten up my mood, I ended my day watching a traditional Cambodian Dance performance put up by Cambodian Living Arts foundation at the National Museum. 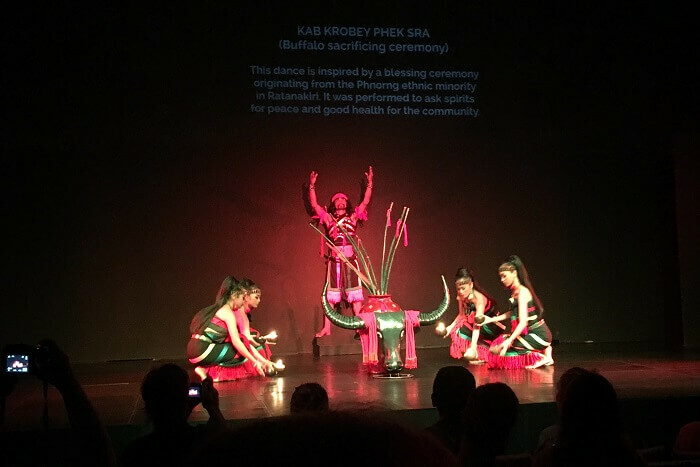 The dances were very artistic and beautiful. I had an early morning bus from Phnom Penh to Siem Reap. 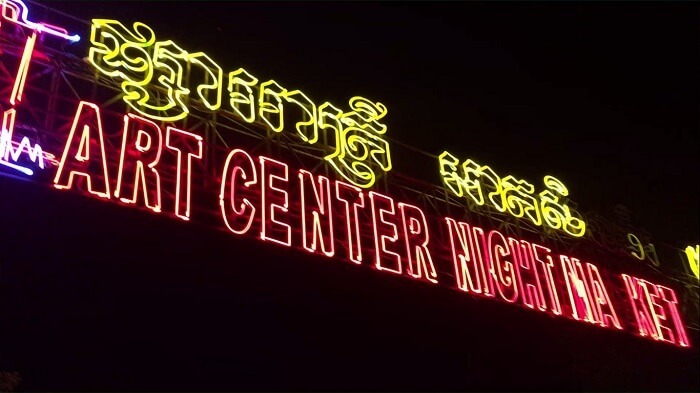 As soon as I reached Siem Reap, I checked into the best hostel in the city – Siem Reap Hostel. After chilling in the hostel for a while and talking to fellow travelers, I took a Tuk Tuk to the Angkor Wat ticket-booking center. I booked myself a 1-day pass for the next day and then went to watch the sun set behind the Bakheng Mountain, a stunning phenomenon that left me speechless. Once I was back in the city, I went out to the Night Market and did lots of shopping. Later, I simply walked around the Pub Street and came back to my hostel to catch up on some much-needed sleep. 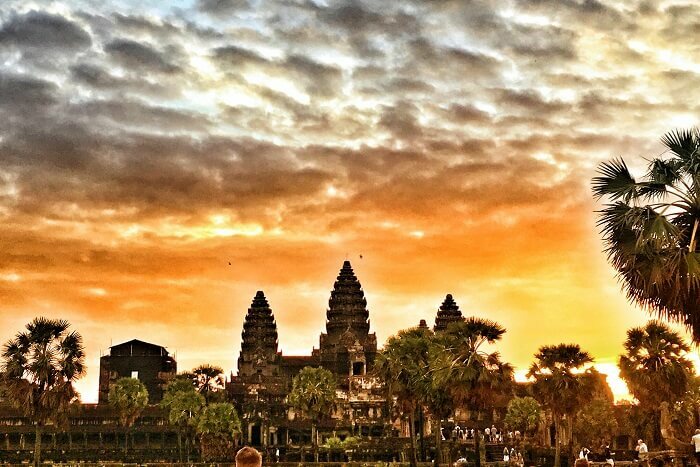 I had to wake up at 4 AM today as I wanted to see the sunrise above the Angkor Wat temple. 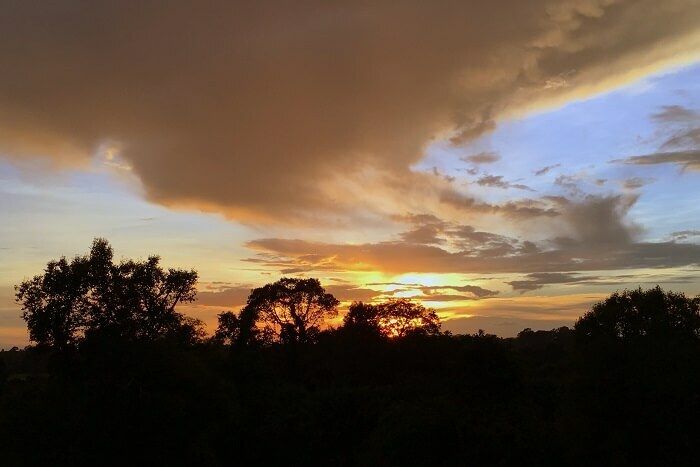 The sight was so breathtaking that I completely forgot my sleep and stared at the sky with an open mouth. Despite the clouds, the view was so awesome that I could not help myself from taking some hundreds of HDR pictures. 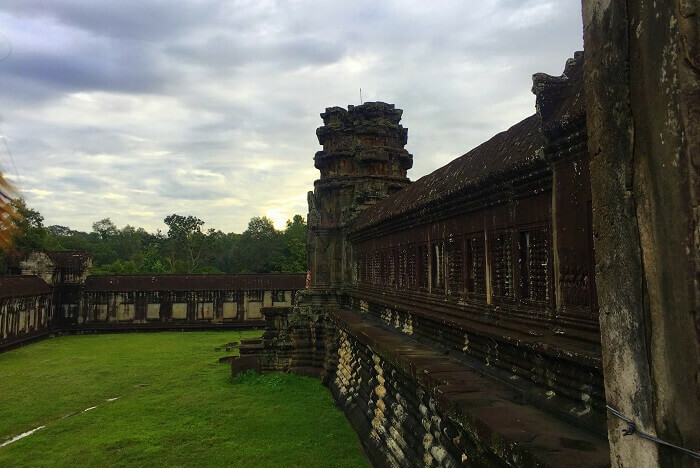 As the sun started it’s ascent, I went around the huge temple complex and admired the carvings, the beautiful and ancient structures and marveled at the thought of how the temples would have been in their prime. 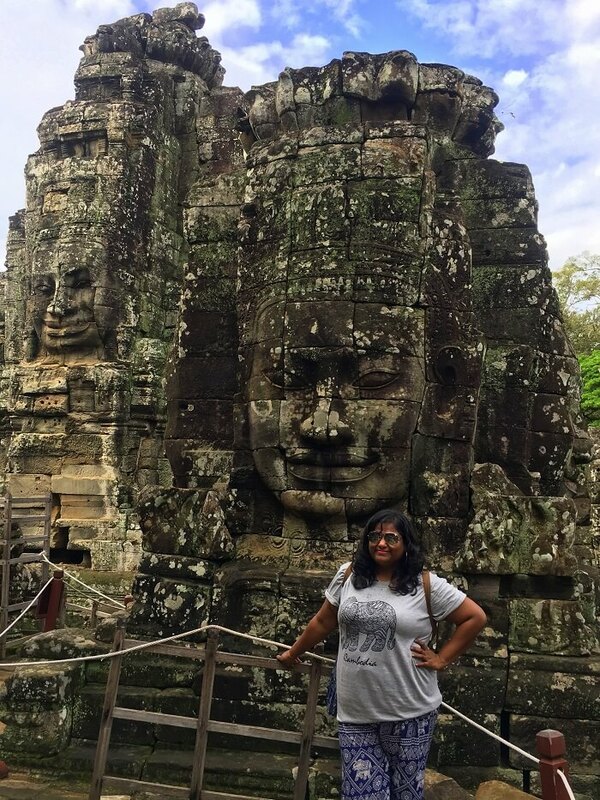 My second stop in Angkor Wat complex was the Bayon Temple. 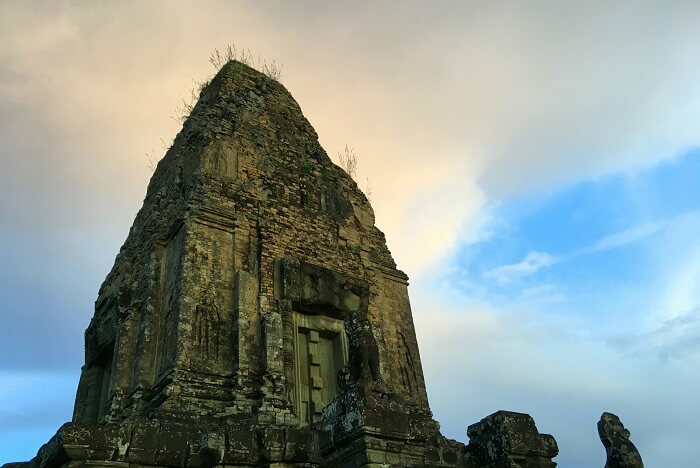 The temple is the center of conflict in Angkor Wat complex – while it is widely accepted as a Buddhist temple, some claim it to be a Brahma temple. The structure itself has a very enigmatic smile that lures in travelers from far and wide. 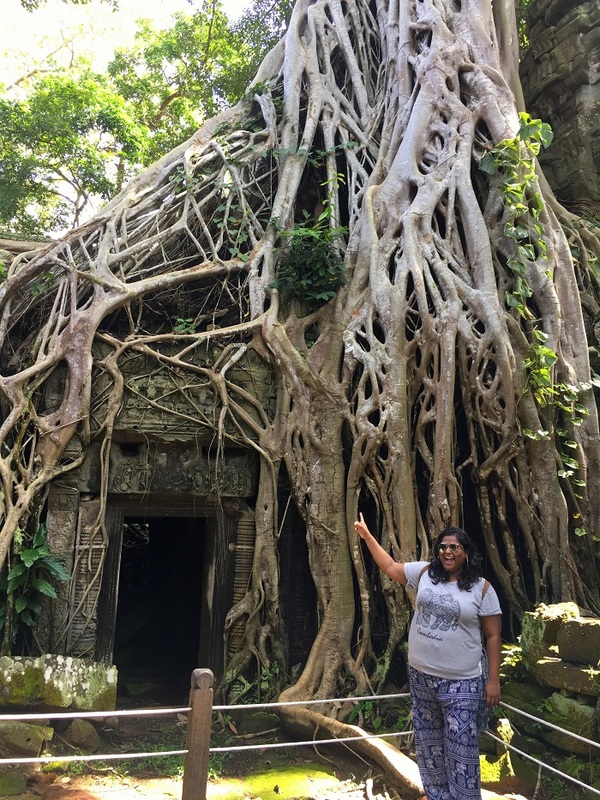 My last stop was the Angkor Thom – the famous tree-tearing-a-temple-apart sight that caught the world’s eyes in Angelina Jolie’s Hollywood flick Lara Croft: Tomb Raider. We could witness the strength of nature there as it had enveloped and engulfed the entire structure, as it the stone and the tree was one! I spent the entire day among these ruins which were awe-inspiring and yet very humbling. 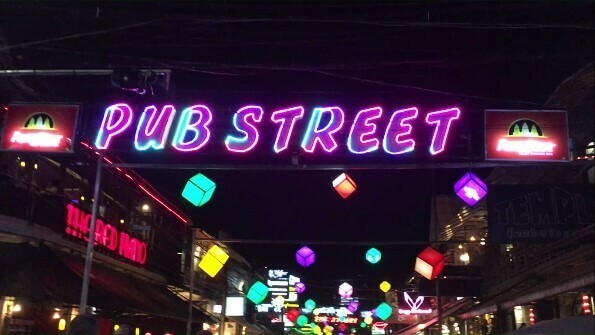 After a short and refreshing nap in the hostel, I went to Pub Street with a few fellow travelers. 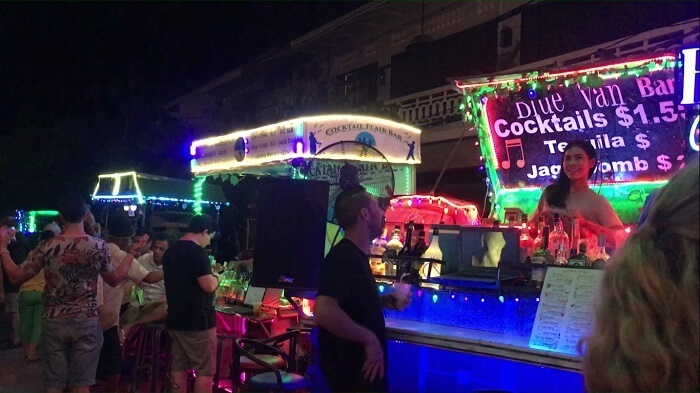 I loved the roadside pubs on the street. At first, it was weird watching people dancing on the roads, but felt quite liberating when I myself joined in the fun! Overall, it was a super fun & crazy night. It was finally time to chill. I sat by the pool in the hostel, read a book, and had some delicious daiquiris. After carefully packing all the gifts I had bought for my family and friends, I left for the airport. Post a long layover in Kuala Lumpur, I touched down in Mumbai. 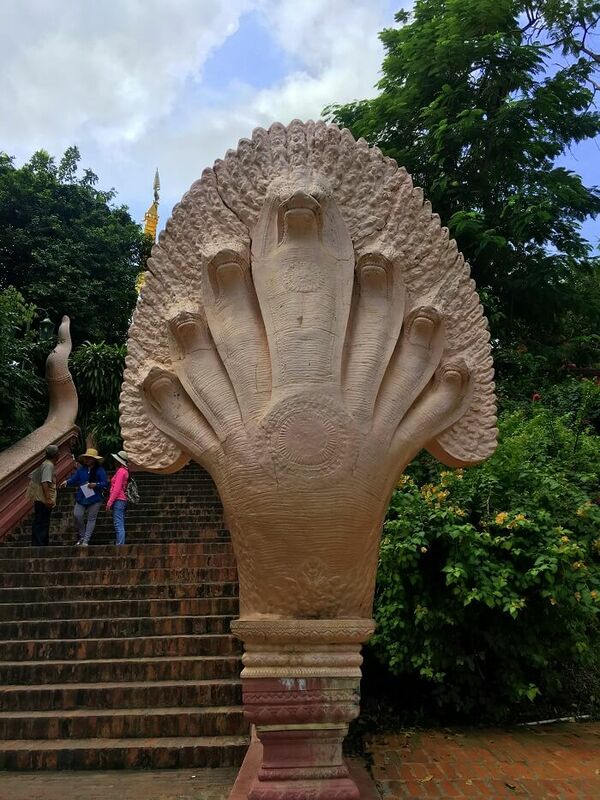 I really enjoyed my solo trip to Vietnam and Cambodia and I thank TravelTriangle for helping me plan it efficiently. I cannot explain the intensity of a heavy heart I had when I came back. When I return from a trip, I love telling my travel stories and inspiring others to explore. 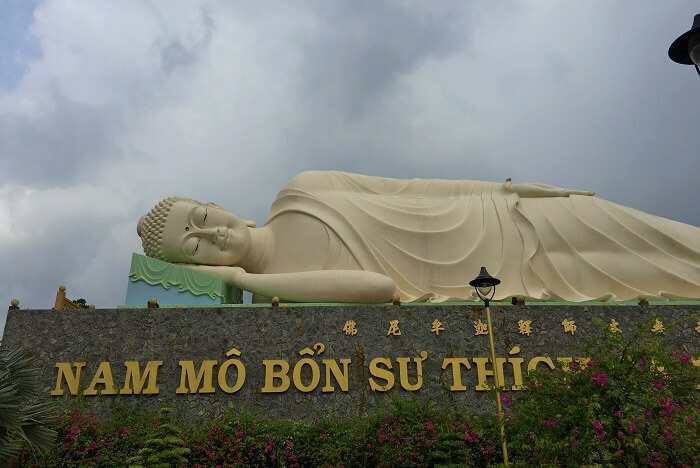 I told a friend so much about Vietnam and Cambodia that she could not resist and booked her trip immediately! 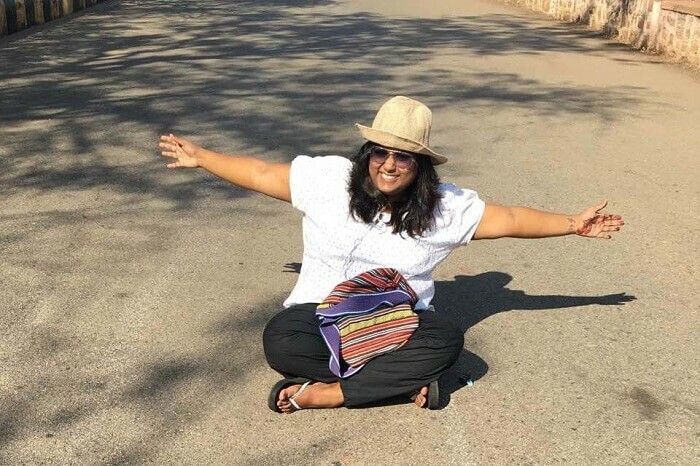 The WOW Moments: My entire trip was a big WOW! But if I have to single one out, then watching the sunrise on top of the Angkor Wat temples was definitely the highlight of the trip. 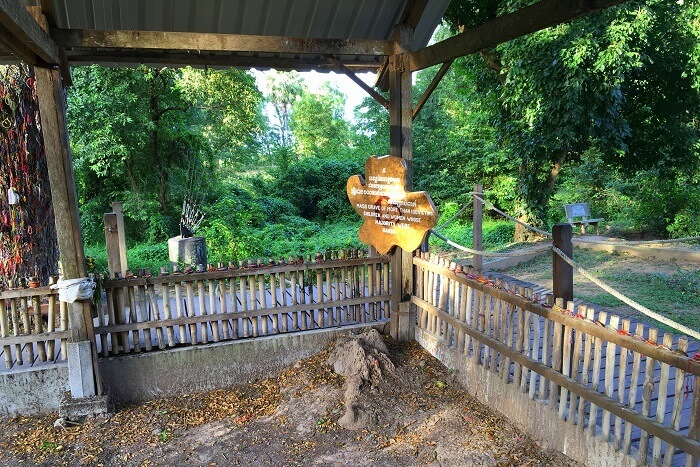 In fact, visiting the Genocide Museum and the Killing Fields, though depressing, too left a humbling mark on me. What I Missed Out On: I wish I could have visited the Cu Chi Tunnels. 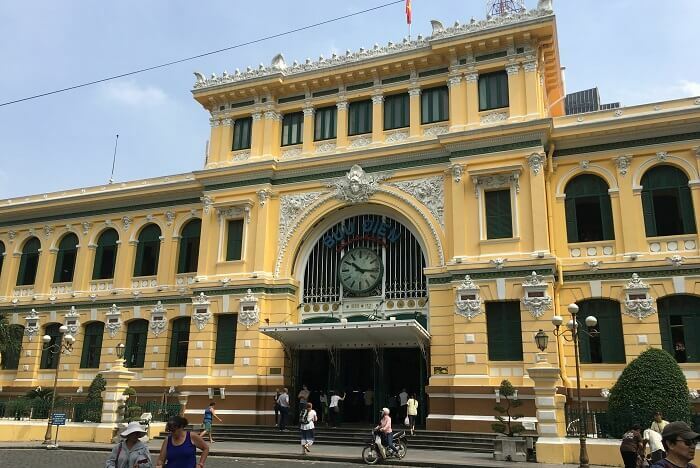 Though Vietnam provides visa is on arrival, you need to register for the visa beforehand and get an approval letter from the authorities. So make sure you complete this formality at least a week prior to taking your trip. Ho Chi Minh City has many motorbikes with pilots. So, if you want to try a cheaper option for taxis, you can opt for these motorbike ride! Hostels are a great option if you are a solo traveler like me. You’ll end up meeting and making friends with many other travelers from around the world. Plus, it’s cheap! 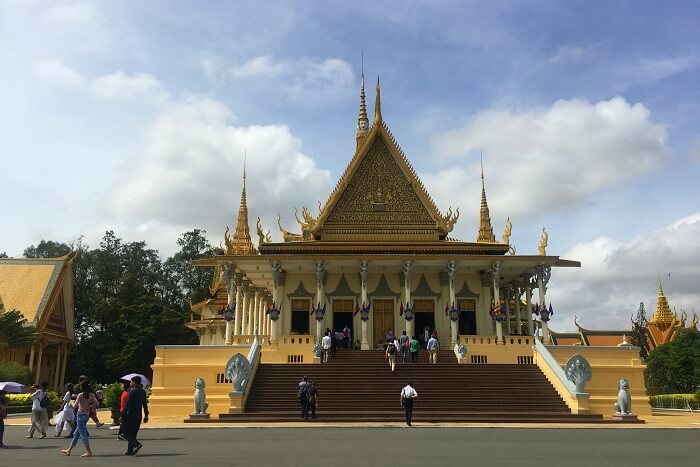 Everyone accepts US Dollars in Cambodia, so you need not carry the local currency. Bargaining is the key to an affordable trip to Cambodia. 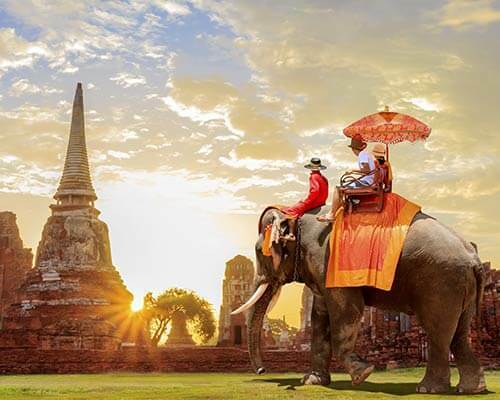 From Tuk Tuk to shopping, you’ll need to bargain everywhere. Do not feel shy! 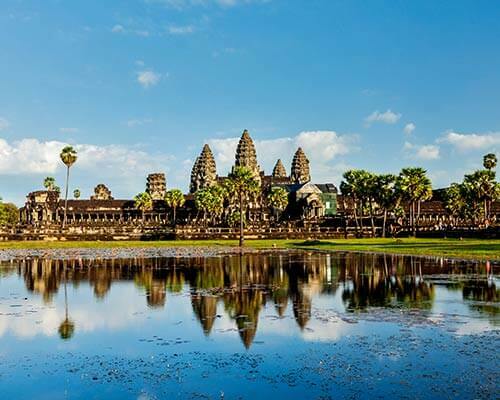 Buy the Angkor Wat temple tour ticket a day prior so as to save 15 minutes of standing in that long queue before the ticket counter the next day. Trust me, you’ll find this very helpful especially if you have to wake up at 3:30 AM for the sunrise! 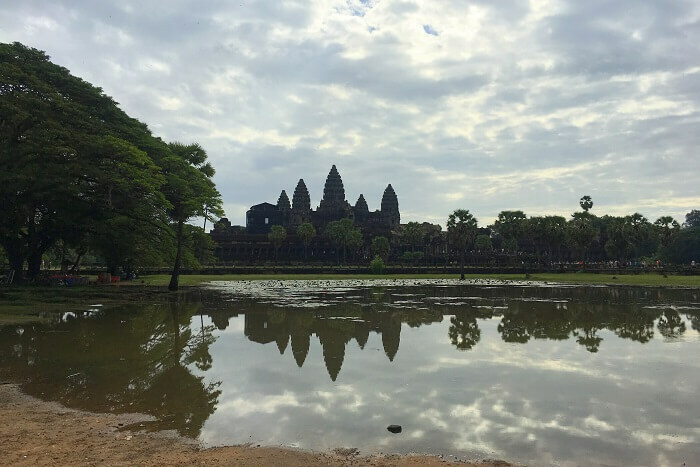 Make a plan of all the places you want to visit in Angkor Wat as the place is huge and it is very easy to get lost or confused. 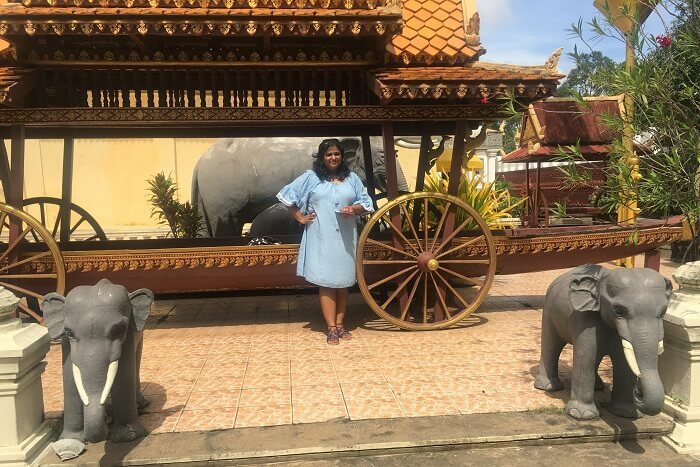 Though there are many options available, I would suggest a Tuk Tuk for going around in Angkor Wat as it is a cheap and efficient way to go about the place. 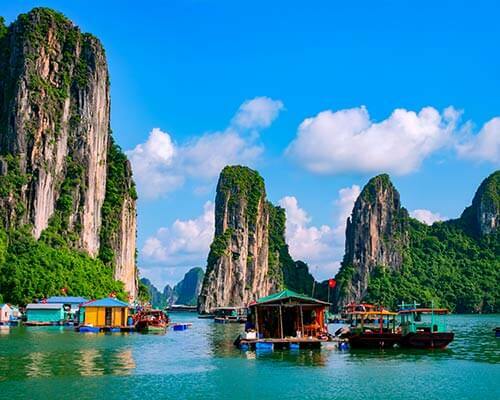 Dreaming already of your own solo trip to Vietnam and Cambodia? Stop dreaming and get to work! 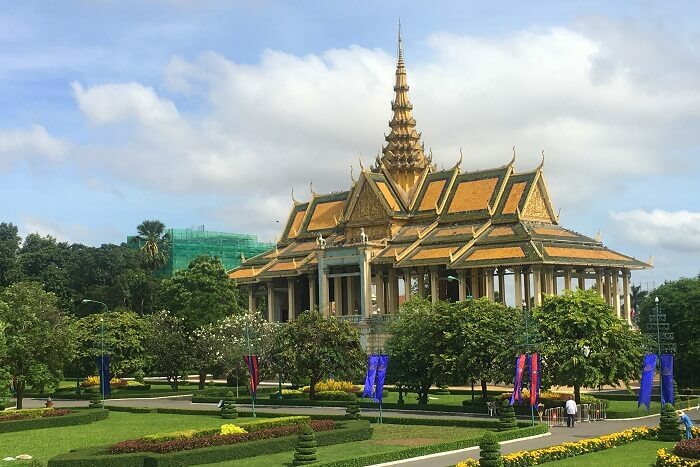 Book your Cambodia and Vietnam vacation with TravelTriangle and go explore the rich heritage, solemn history, and stunning attractions. Happy Tripping!